In a recent painting I was struggling with some lighting effects. The image I'd planned depicts one of the main characters in a story shooting it out inside of a spaceship hangar. My new tutorial video is out! It follows a brief lecture as I go over some points on painting armor. You can find it at my Gumroad. I've decided to start making tutorials on a regular basis. Most of them will be between 20 minutes to an hour long. It's always been my belief that an artist of any quality owes it to the world to pass on knowledge in some form, and with the digital age that's never been easier. When I was 6-years-old, we got our first personal computer at home. Santa brought it. I remember being overjoyed the day they set it up. After days of playing on my mother’s typewriter when she would bring it home for work the idea of a new machine to tinker with was one I couldn’t refuse. Much like painting after it, I was hooked on computers. I can’t tell you much more about the machine, besides that it came with a hunting game- the first version of Cabela’s Big Game Hunter. I’d loved playing video games before we got the computer, of course. Mario and Street Fighter in particular were favorites between my sister and me. Years would go by with me tinkering with the computer on and off, until something changed. Final Fantasy 7 was released for the Playstation, and I was hooked there too. I didn’t fully understand all of it, but I played it for days on end, building up my characters while the story soon consumed my waking hours. I loved exploring this world and figuring out what to do next, discovering the mysteries hidden within its depths. Walking around a world at my leisure was relatively unheard of before, and for a child growing up in the flat fields of Mississippi it was a godsend that opened more doors than I can count, but that’s another story. My cousin handed me the game when I was 8. He thought I might like it. He had no idea. Whereas Final Fantasy let me wander around the story, Baldur’s Gate helped me create my own. Around every corner were choices for my character to make depending on what I wanted. I could be a fighter, wizard, thief, anything! I could type out their background and modify their portraits and clothes. Each new step into the world introduced me to a new person to talk to, a new quest to take hold of, abilities weapons and armor to use in overcoming those adventures. It would be impossible and unworthy to describe in words how enthralled I was in those tales of the Sword Coast. By far, the best part of the game to me was the other “players,” My party and friends to meet every time I jumped into the world. Choices in conversation were relatively unheard of to me in video games and I reveled in picking at the other characters backstory to learn more about them and what they would mean to me as I continued on my quests. We went through a lot together, from kobolds to bandits to overthrowing the Iron Throne. Afterward, we would go and do it all over again. Each time would be different and just as fun, but the one thing that never changed were companions. I always knew right where to find them! One of these friends stuck out to me the most, though. His name was Edwin Odesseiron. He was a Red Wizard from the land of Thay. Despite his crude and selfish attitude, he was one of my favorite allies. His power was immense in combat and his wit outside of it was entertainingly cutting. Despite the days we wandered around the realms, Edwin never revealed much of his past to me, although the other companions were forthcoming with such information. True, he never got along with anyone else and preferred being left alone, but like most things you can’t have that just made him all the more intriguing. Baldur’s Gate II released years later, and again Edwin would join in my party as we defeated more powerful challenges. Just like before he was resistant to say anything about himself. We’d beaten monster after monster together, but as the game ended he was as silent as he’d ever been- a lone and dark mage that only thought about himself and preferred to be left alone. At the time, you’d be surprised how familiar that sounded to a reflection. I grew older, discovered Dungeons and Dragons, which I loved just as much as anything before it (seeing a pattern here?). I’d always enjoyed reading, so naturally the books they released with the game were just as occupying as playing it. One of my favorites to peruse, as you can imagine, was the guide to the Forgotten Realms. 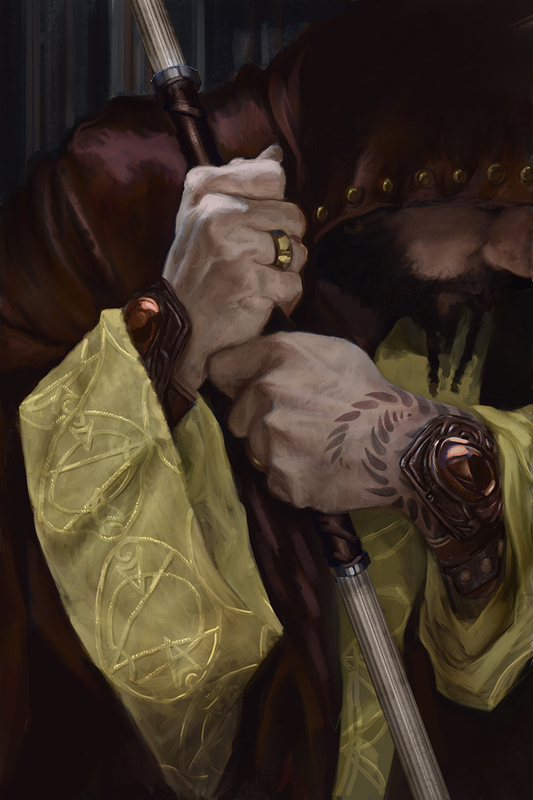 Besides having information on newer beloved character like Drizzt and Elminster, there was a small section on Thay, and the Red Wizards that inhabited it. There was no mention of my old friend Edwin, but I could imagine he was there all the same. I continued to grow, and years went by without thinking much of it. I learned to paint, and that consumed a lot, but I like to think those rarely-mentioned days spent inside on a computer as a child were always there with me, that the part of me who adventured in games was still doing that in some way. This has all been a long-winded way of letting you know that I still play Baldur’s Gate, today. I picked it up to revisit those old friends a while back when Beamdog rereleased it. Some friends and I started playing it from far-off, given that we could connect together on the Internet. Having a party you’re not entirely controlling was new, but fun. We started making games where everyone would play their own character, but I soon found that I could even play as Edwin, myself, entirely. It was a totally different experience, and entirely nostalgic- except this time I felt like I had to be inside the wizard’s head. What did I know about him? What would he do in this situation? Where would he go and what choices would he make given the opportunity? In wanting to do him justice in my actions I ended up developing the personality and inner-thinking a younger me had oft wondered at. As the next round of Dungeons and Dragons came around I thought, “what better character to create than someone I know better than anyone else?” So I crafted a character sheet of a wizard and named him appropriately. Edwin Odesseiron. It was the closest I’ve ever felt to a character I had to “make up.” Without explaining all those adventures, we’ll just leave it at those adventures with new and different friends holding a special place in my heart. I hope you enjoy the new site. I'll be posting much of my work and process, here as I get to writing. Feel free to look around!